Although the information contained on this web site has been produced and processed from sources believed to be reliable, no warranty expressed or implied is made regarding the accuracy, adequacy, completeness, legality, reliability or usefulness of any information, and this information is provided on an "as is" basis. Changes that have occurred to this information may not be incorporated into the latest version of the web site. Data can quickly become out of date and electronic data may be altered subsequent to its original distribution. Neither the Office of the Perry Township Trustee, The Perry Township Small Claims Court, The Perry Township Board, its officials, officers or agents, nor the contributors to this web site, shall be held liable for any error, omission, defect, delay in transmission or operation, computer virus, communication line failure, theft, destruction or unauthorized access to, alteration of or use of information contained on this site nor for the improper or incorrect use of the information contained herein or otherwise. The Office of the Perry Township Trustee, The Perry Township Small Claims Court, The Perry Township Board, its officials, officers or agents, nor the contributors to this web site shall not be responsible for the contents of any off-site pages referenced, and such links are provided for information only and does not constitute an endorsement of any kind. Third parties may place defamatory, offensive or illegal material on this web site, and the risk of injury or harm from such materials rests entirely with the user. 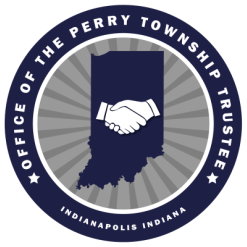 External Links - The Office of the Perry Township Trustee, The Perry Township Small Claims Court, The Perry Township Board, its officials, officers or agents, nor the contributors to this web site, cannot and does not guarantee the accuracy of the information supplied to them by others, or any information on pages linked to the Office of the Perry Township Trustee pages. No responsibility for this information can be, or is, assumed. Inclusion on this site does not indicate or imply an endorsement by the Office of the Perry Township Trustee, The Perry Township Small Claims Court, The Perry Township Board, its officials, officers or agents of any site or information.